Bought a few polishes over the past few weeks mostly cheep stuff but i cant afford to shell out 10 or more a bottle id have 50 bucks in polish right in front of me if I did. 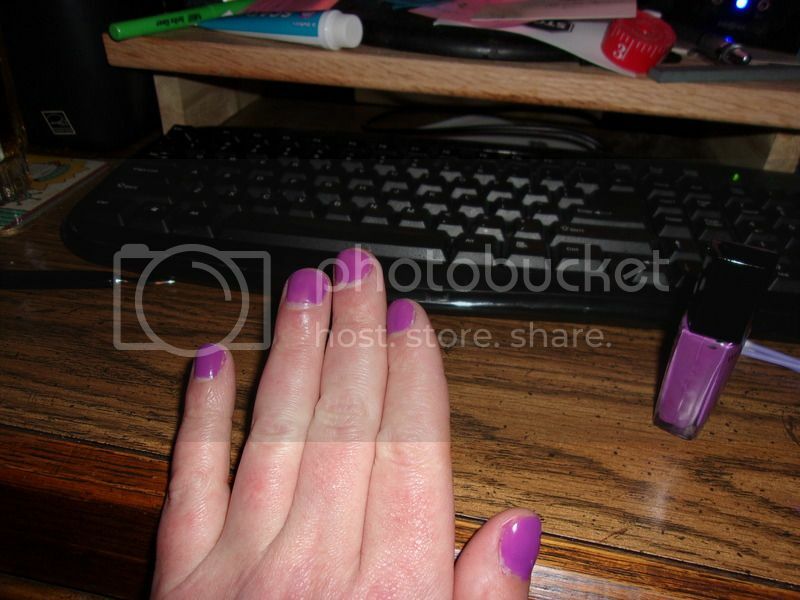 I have maybelline color show "pink embrace", orly nail defense "clear" for bases/tops and going incognito since i'm not out publicly or presenting, la colors color crazy "a purple glitter" (i love it but man is a pint to remove any tips for this?) wet and wild "putting on airs" and my new favorite wet and wild "ultra violet. I think i'm getting pretty good at applying considering i have to remove my fingernail polish as often as I can put it on but id like to know what you ladies think and maybe get some tips. One thing i usually do is line my nail with vaseline and if i want a fast dry ill use some cooking spray. In addition for the small messups if I have any close to the nail ill use a q-tip dipped in nail polish remover to precisely clean just what I want. Heres some pics of my arsenal its growing fast. My sisters seen my toes and actually wants me to do her fingers some time maybe I could get into doing it professionally someday if i could ever pay for schooling makeup and/or nails might become a new passion of mine. Altho hard to see me doing it i'm a 208 lb 5'10" handy man i fix your lawnmowers replace your electrical panels fix your pluming leaks and anything else around your house that's busted then again a year from now when i start socially transitioning I might change my mind. Here's the photos they're high res sorry if your nets not up to speed and i'm including one polish i got from a friend but didn't like it a cracked orange i returned it to her altho I do think if i chose a different base color under it then my pink one it might of looked good but at the time all i had was my clear and pink I just bought the other 3 today all for a buck ea now that i'm brave enough to buy some stuff in person in guy mode. If you like the look of the pink embrace and want to buy it be warned its very thin even after shaking it it still takes 5 coats to get it looking like that putting on airs is 2 coats rest was 1. My favorite has to be the purple unfortunately it has to come off tomorrow. Hey Rylie! Your nails look great. You've learned the secret about some nail polishes that they can be thin and require multiple coats. This is fine if you want the translucent looks but I find it a pain. The brand I like now is Essie. My wife bought it for my Christmas stocking. If I recall she found it at Kohl's, but I've seen it in other stores. I would say its mid-priced. It provides great coverage and the colors are awesome. I don't use the base/top/clear styles as they can get expensive and I'm too frugal for that. For removal, just get a bottle of nail polish remover (I use Market Basket brand) and a bag of cotton testicles. Also you can prep your nails by buffing them. There are sanding/buffing blocks you can get that make your nails nice and smooth. There are four sides with increasing fine grades so you can actually get a nice shine on the nail at the end. I know how to remove regular nail polish but ever try to remove glitter polish? If you have you'll know its a pita best way i've found is to use napkins soaked in acetone the stronger the better and rub like crazy however I did look it up and there's special kits for glitter polish there not to expensive ill probably buy one if i plan on using it again. I was tired of seeing my toes pink so there purple now just spent a hr 1/2 to strip and repaint. I don't use polish often as it is one thing my partner hates but do paint my toenails when I get chance. Just a pink similar to yours but as it is not pronounced I can leave it on even when out with barefeet when in the garden. I am no expert but do realise that the acetone in remover is not good. I use a remover that has added oil and also have nail oil as well. When I moisturise my hands I use a hand cream that is for nails as well as hands. This has stopped my nails cracking so much as they get brittle when subject to solvents. It is worse for me as we do use iso propyl alcohol wipes at work which dry the natural oils as well. Ya normally i dont use pure acetone its not good for your nails I have bottles of nail polish remover but remember acetone is still them primary ingredient in nail polish remover. I use purer stuff for glitter polish the reg stuff wont do the trick then ill thoroughly wash my hands/toes soak my fingers or toes in reg polish remover get rid of anything remaining and repaint finishing with a good moisturizer. 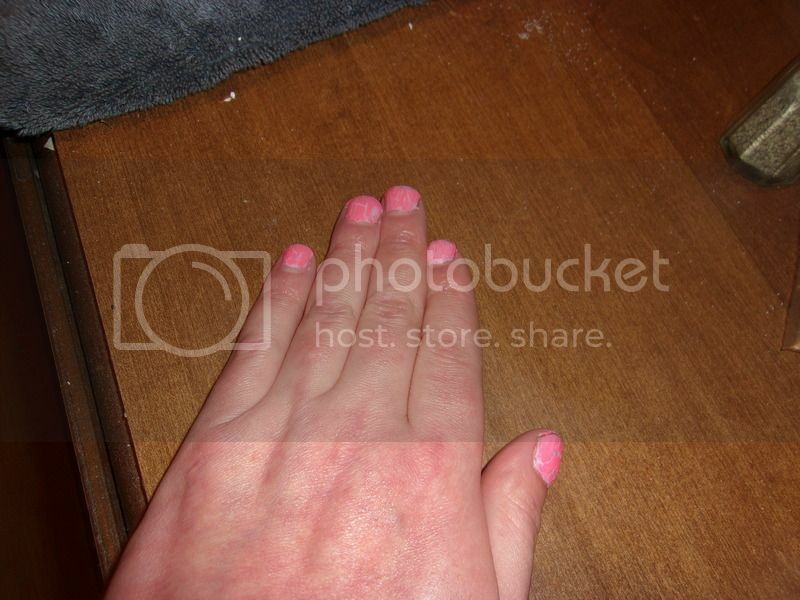 You really do get what you pay for when it comes to nail polish. The cheaper stuff takes more coats because it's usually thinner. There's a reason most nail salons don't buy cheap polish: it's horrible. If you want to splurge, go to Sally Beauty Supply and browse their OPI section. OPI nail polish is one of the best around. I see you have Orly clear polish. Orly is a really good brand, too. My nails are a hot pink color that Orly makes. As for removing glitter polish: girl, just soak and scrub. That's all you can do. The glitter will get all over your fingers and hands in the process but that's really the only way to get it all off. I'm told glitter is the herpes of the arts and crafts industy, you cant get rid of it! Giggle. Well been awhile since i've posted here but I have been going to a sally's there's one less than a mile from my house infact was just there a few hours ago buying yet another polish i swear its a addiction i'm up to 15 different colors mostly OPI at this point plus I now have one of there discount cards and every employe know me. There help me with the rest of my makeup picking this out that will work well with me and my needs to remain stealth at this time and I stopped bothering with the glitter exp since i Just keep my nails painted 24/7 now with shades that are hard to notice. TBH the first bottle of glitter polish I got I didn't even know it was glitter polish till i tried it out at 35 years old I dont see glitter as something I should be wearing. 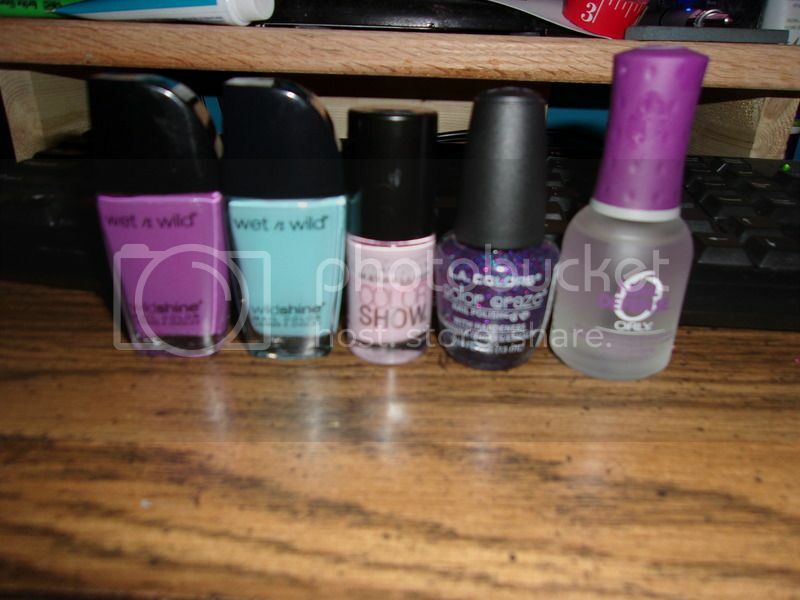 My current favs are "Wet n Wild: Caught Red Handed" and "Wet n Wild: Through the Grapevine". Just did this because monday starts pride week here my fingers will get the same treatment next saturday when I can both feel safe dressed male and I know when I ruin my manicure as I know I will I wont have to redo it for the next day I cant keep manicures at all late into the week I work with my hands alot so usually my fingers right now are just clear coated. Yes i'm quite aware of my ugly tan lines on my feet ive been wearing sandals everywhere for the past 2 months unless I need boots/closed toed sneakers or doing offroad bike riding and need my clipless pedals/shoes im also aware then need more work mostly cleaning up I have a hard time reaching my toes my guts to big and have alot of pain in my hips when I bend/twist certain ways gotta love being born with both hips being dislocated and never getting em completely put back in place. Cute..... A veritable trans* flag. Don't worry about the tan lines. Only folks who go to tanning salons or have the time to tan evenly have no lines. As a farming person the sun leaves me with some oddities as well but i wear then with pride.....like your toes. Im not unlike some I dont mind a farmers tan or the tan lines from my sandals unless I go barefoot you cant see it I dont go barefoot often. This was a idea a good freind of mine and I had for pride week shes doing the gay pride flag. My tan is not as deep but sandals make their mark (lack of colour on toenails at the moment as well). One trick is to use stick on nails and paint them up. They provide more room to paint and are easy to take off. Going to Pride as a Pink Bear sounds fun but, riding with Dykes of Bikes and passing would cool. That's not to bad of a idea im sure I could get some cheep fake nails and just files em down reasonably short I don't like long nails be less cleanup I have very unsteady hands. Got a set of french tipped fake nails i'm currently now redoing the tips in the trans flag color pattern my therapist gave me the idea of just redoing the tips. I do my finger nails, and typically they last 2-3 days before chipping. But I can extend it to 4 days touching up the tips. Mine would last but i tend to work in construction or dishwashing frequently scrubbys are terrible on your nails nm what I deal with on construction jobs. I plan on getting a gel coating setup as soon as I can afford it then I dont have to worry about chipping a nail or totally wrecking it. When I was growing up (in NH) my mother and most women I knew wore rubber gloves doing scrubbing or anything dirty in the house. They did not go outside for long or do any work without wearing gloves or for that matter some makeup and a broad hats to protect their skin from the sun and their hands digging in the garden. Men did and some still do the same thought, its hard to find the thin and tight calfskin gloves that make for delicate work with protection and when you do they are expensive. When I worked as a cashier, my nails were always getting caught or tearing on this or that. I would be in awe of some of the women I worked with who kept their nails long and manicured and pretty despite doing dirty work. 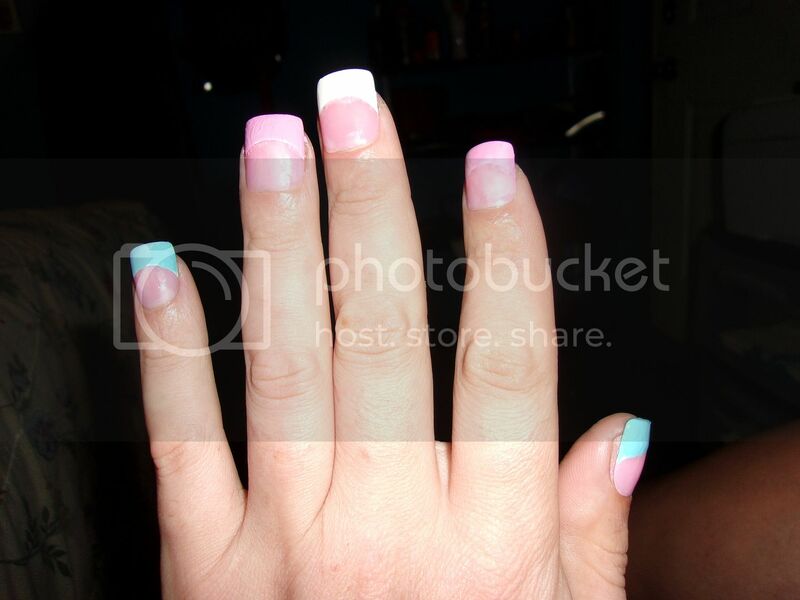 Ok here's the fingernails for the next few days if they hold and or dont break.